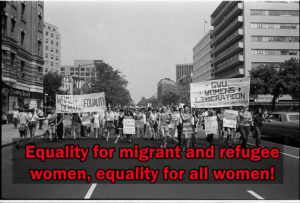 In marking this year’s International Women’s Day, KISA – Action for Equality, Support, Antiracism notes the progress and salutes the past and ongoing struggles of all women, and men, across the globe towards gender equality and recognition of women’s economic, political, social and cultural rights as human rights. A goal, however, that remains not only unattainable but is seriously eroded and undermined, with gender inequality persisting and further deteriorating. In light of and with the excuse of the present global economic crisis and all that it entails, prolonged wars and conflicts that have resulted in large movements of people seeking safety and survival, the fear of fundamentalist and terrorist organisations and the re-emergence and rise of populist extreme right, neo-Nazi and fascist groups and parties with openly racist, nationalistic and anti-migrant agendas, the European Union and its member states, individually or in blocks, have succumbed to regression and compromise of their founding vision and principles. KISA wants to bring to the forth that, although this affront to democracy and human rights hits hardest at women in general, the women most directly affected are migrant and refugee women who, together with their children, form the most vulnerable section of the weakest and most disempowered communities in our society. Subjected to the most abject working and living conditions, violence and trafficking for labour, sexual and other forms of exploitation, institutionalised and multiple discrimination on grounds over and above their gender, migrant and refugee women are marginalised and excluded. Migrant and refugee women are ignored and excluded from essentially all state and government mechanisms, policies, plans and measures intended for the pursuit of gender equality, improvement of women’s position and their protection. What is more regrettable, however, is that these women are usually also invisible and excluded from the agendas and actions of women’s organisations and groups that purport to promote women’s rights and position. In this negative context, KISA welcomes the invitation and reaffirms its decision to be one of the co-organisers of the Women’s March in Nicosia, on 8 March 2017, in order to join our voices with women and men from all communities in Cyprus and call for peace and a solution to the Cyprus problem, for equality and human rights, against discrimination, racism and nationalism. Join us tomorrow, 8 March, at 17:30 (16:30 for the North) at the end of Ledra Street! The march will head towards Ledra – Palace. For more details about the March please click here.